How are you doing this morning? 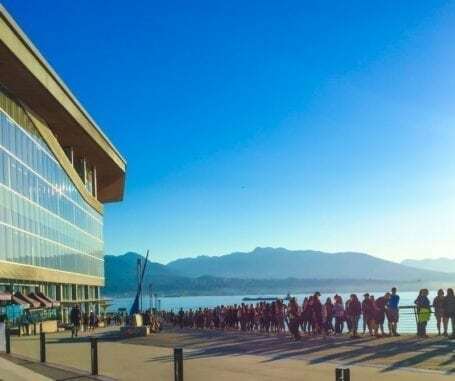 It’s Seawheeze weekend, and words can’t describe how excited I am for the festivities that are about to happen. Actually – they’re already happening. Yesterday I was helping out with the setup of the exclusive Runner’s Shop at the Vancouver Convention Centre, and get this: people had already started lining up on THURSDAY MORNING! Guys, the shop doesn’t even open until this morning (Friday) at 7am! By the time I left last night the line had wrapped around the Convention Centre just like it has every other year. I’ll be headed back later today to check out all the activities in the plaza, and if you’d like to follow along, stay tuned to my Instagram stories. And of course, if you happen to be here for the race this weekend, I’d love to meet you! Come on up and say hi, or tag me on Instagram at @eatspinrunrpt if you check out any of the spots I recommended in my Seawheezer’s Guide to Vancouver. I had no intention of posting today, but happened to have a wicked workout on Thursday morning that I really wanted to share. Let me preface it with the statement that I’m almost POSITIVE I’ll regret this one while racing tomorrow, and it’s probably not the circuit you want to do before a half marathon. 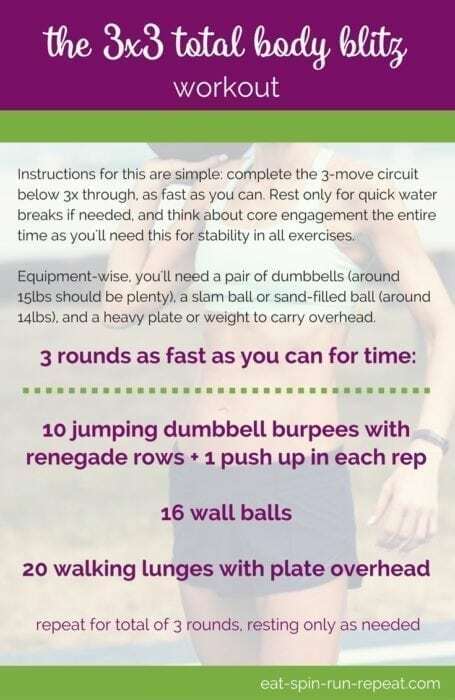 However, this is a great total-body workout that you can do in about 15 minutes and feel a huge impact. It’ll work every muscle you’ve got, get your heart rate up, and keep that metabolism stoked for the remainder of the day. Enjoy! Instructions for this are simple: complete the 3-move circuit below 3x through, as fast as you can. Rest only for quick water breaks if needed, and think about core engagement the entire time as you’ll need this for stability in all exercises. Equipment-wise, you’ll need a pair of dumbbells (around 15lbs should be plenty), a slam ball or sand-filled ball (around 14lbs), and a heavy plate or weight to carry overhead. Jumping dumbbell burpees with renegade rows + 1 push up: Stand holding a dumbbell in each hand at your sides. Lower them to the floor and jump back into high plank. One at a time, row each dumbbell to your rib cage and lower them back to the floor. Do 1 push-up with your hands on the dumbbells, then hop your feet back in towards your hands and jump up, picking up the dumbbells but keeping hands at your sides. That’s 1 rep! Wall balls: Stand with a slam ball in your hands, holding it near your chest. Position yourself about 1 foot away from a wall. Lower into a deep squat, and as you push through your heels to stand, throw the ball up against the wall as high as you can. Catch it and lower back down into your next squat. Continue for all 16 reps. Walking lunges with plate overhead: Perform walking lunges as usual, but hold a heavy plate overhead with both of your hands. I’m definitely in a party mood today, and this dance remix of I Will Learn to Love Again by Kaci Battaglia is one that’s getting me moving this morning. Apologies to any dudes out there who find it exceptionally girly, but…. #noshame. I’m digging it! How to organize your stuff and your life – via Outside Online. Loved this article! 14 Cardio Exercises You Can Do With a Kettlebell That Aren’t Just Swings – via Greatist. You guys know I love a good kettlebell workout, and if you want to get beyond just doing standard swings (which are awesome, by the way), here’s some great ideas. Over to you! Tell me… what’s on your agenda this weekend that you’re looking forward to most, AND what’s one song you love sweating to right now?